I hope all of you are enjoying the holidays. December is always such a busy time. If you are like us, Christmas is a time of gift-giving and feasting with loved ones. 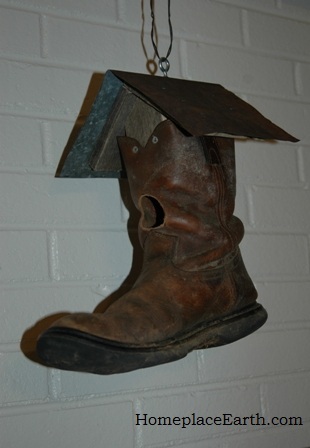 Often homemade gifts are exchanged, such as the boot birdhouse we received from our daughter and son-in-law. The week between Christmas and New Years, however, is usually a welcome slow down for us. It’s a time to shift gears and think of changes ahead. 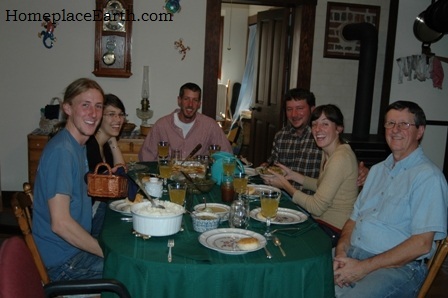 As you eat your way through the holiday, I would hope you would keep in mind others around the globe whose table is not so full. You can learn more about some of these people and how to understand and assist them through the following organizations. Ecology Action teaches people worldwide to better feed themselves while building and preserving the soil and conserving resources. Find out more at http://www.growbiointensive.org/. My teaching is based on Ecology Action’s GROW BIOINTENSIVE methods. Ecology Action puts out a quarterly newsletter that has a garden report you might find interesting if you are serious about GROW BIOINTENSIVE. Heifer International works with communities to end hunger and care for the earth. They are best known for donating animals and training to community groups in impoverished areas around the world, but they also have other sustainable projects, such as tree planting. Heifer publishes the magazine World Ark which is a wonderful resource to learn more about their initiatives and meet the people they help through the pictures and stories. There are several Heifer International centers where you can learn more about world hunger and what to do about it. I’m most familiar with Heifer Ranch in Arkansas. Find out more about Heifer at www.heifer.org. Lambi Fund of Haiti works toward economic justice, democracy, and alternative sustainable development in Haiti. The Lambi Fund is based on the premise that the Haitian people understand how development is best achieved in their country. Therefore, the Lambi Fund follows the lead of grassroots organizations in program and priorities. The Lambi Fund never dictates to a community organization what should be done. Through discussion and reflection, the peasants decide what is best for their community and present the project to the Lambi Fund for support. Learn more about their work at http://www.lambifund.org/. Tillers International encourages an attitude of experimentation to produce more local food with less global fuel. This organization maintains a farm/learning center with classes in appropriate technology farming techniques, draft animal power, blacksmithing and metal work, timber framing, woodworking, cheesemaking, and many other skills. Their work includes maintaining a museum of farm tools and machinery which they use for inspiration to create tools needed in developing countries today. Tillers International Cooks Mill Learning Center is located in Scotts, Michigan. Find out more at www.tillersinternational.org. Trees, Water, & People develops and manages continuing reforestation, watershed protection, renewable energy, appropriate technology, and environmental education programs in Latin America and the American West. Part of their work is with fuel-efficient stoves. Find them at http://www.treeswaterpeople.org/. Think globally, act locally has never meant more to me. These organizations will give you a glimpse into how others around the globe live. My work is with food. I feel strongly that in order to make sure people around the world have enough to eat, we must first learn to feed ourselves, and do it sustainably. In 2012 my blog posts will concentrate on what it takes to truly feed ourselves from homegrown and/or local food supplies. Understanding that and making it a part of your daily life, helps to give you the skills and knowledge to better know how to help others do the same, no matter where they live. Besides growing the food, or buying it from a local farmer, learning to cook for yourself from scratch and getting the food all the way to the table using the least fossil fuel is all part of it. Thank you for following my blog this year and for being part of the journey. As we head toward the New Year, my prayers are with you. May your table be full of good food and happy people. 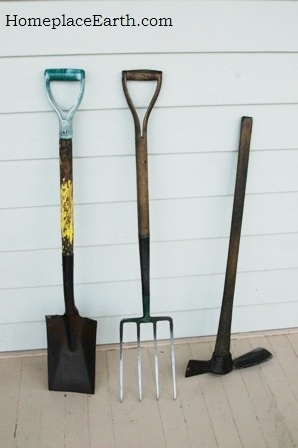 Since I advocate managing your garden with hand tools, I thought I would show you what hand tools I use. When breaking new ground a mattock is great for taking off the existing vegetation. Let the weight of the tool do the job for you, sliding the head under the sod and lifting it off. It might be necessary to mow the area before you begin, depending on what is there. You can find a mattock in your local hardware store. Often the head and wood handle are sold separately. The heads come in different sizes and weights and some heads have a sharp point (pick) on one side. Make sure you are buying the style and size you need for the job. If you were digging out bushes, you would find this extremely useful. To double dig the beds I use a garden fork and spade. Directions for double digging are in the book How to Grow More Vegetables. My beds were double dug when I established them years ago and now the roots of my cover crops keeps them friable. So for me, the spade gets used edging the beds and the fork is used for digging potatoes and sweet potatoes. Sometimes I use the fork as a mini-broadfork to loosen the soil. The fork has thick flat tines. Notice the length of the handles. Some people may find the tools available locally to be too short. If you are over 5’5” tall, you may want a spade and fork that is 43” long. Bountiful Gardens carries good quality forks and spades in 39” and 43” lengths. My fork is from Bountiful Gardens and my spade was bought locally. 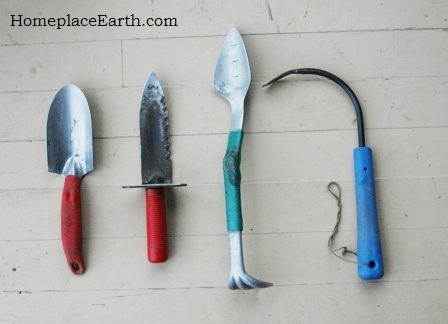 For transplanting I use a trowel or a soil knife. Good quality trowels are easy to find. Poor quality trowels are even easier. Choose a sturdy one that will hold up to lots of hard use. I have a Lesche soil knife that I like to use when transplanting into the cover crop residue. I got mine from www.waycooltools.com. I also have a Trake that is pretty handy. It’s a trowel on one end and small cultivator on the other. It was a gift from my aunt many years ago. I’m sure there are sources on the web. Colorful handles help ensure that you will find these small tools when you lay them down in your garden. Once I had a trowel with a black handle that spent most of its time lost in the grass. If you find that you are always losing your wood handled tools, you could paint them a bright color. It might look gaudy, but it definitely makes them easier to find and distinguishable as yours if you take them anywhere. I use a long handled cultivator that I purchased at our local feed store. It is a good sturdy tool that I use for incorporating broadcast seeds and for mixing in compost. The hoe I’m currently using is a 7” collinear hoe. Most often I turn it on its 1″ edge to make furrows or to weed among closely spaced plants. I also like a 5” wide trapezoid hoe. Both hoes are available from Johnny’s Selected Seeds. Johnny’s is a good source for many tools for market growers. Another cultivating tool that I really like is my short handled Cobrahead. I use it for both light work and to chop out something tough. It’s available many places, but I got mine from the folks who produce it. You can find them at www.cobraheadllc.com. For managing my cornstalks, I use a machete. It is available from Northern Tool+Equipment for $8 and even came with a cotton sheath to hang on a belt. 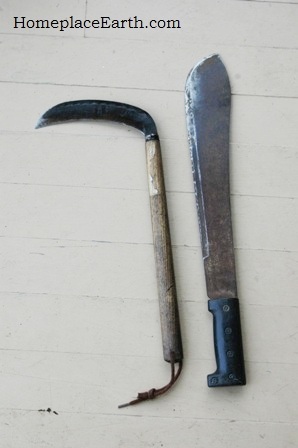 The Japanese sickle I use to cut rye and wheat is available from Hida Tool & Hardware Co., Inc. I wrote about the sickle on May 17, 2011. A less expensive model is available from Way Cool Tools. You can see the sickle and machete in action in my video Cover Crops and Compost Crops IN Your Garden. I hope this is helpful to you. If it’s not too late, you might want to put something here on your Christmas list. You could email this post to your Santa. My Santa loves it when I give him suggestions including links of where to get them. No doubt you will find many other items to put on your wish list when you browse these sources, but these are the tools that get me through the gardening year. Anyone else have a favorite tool they would like to tell us about?